Has it stopped raining yet? And when it does, can we please have our Flat season back? The first ten weeks of the level have been as entertaining, intriguing and informative as ever. And they have yielded some true star turns, such as Classic winners HARZAND and MINDING, progresive sprinters PROFITABLE and QUIET REFLECTION, classy stayer ORDER OF ST GEORGE, formidable fillies USHERETTE and QEMAH and exciting juveniles LADY AURELIA and CARAVAGGIO. But there is no doubt they have also been blighted by the weather. To such an exasperating extent that, for the first time in living memory, the Guineas, the Derby, Royal Ascot and the Eclipse, have all been dogged by ground with Soft in the going description. I was delighted to read ‘Racing Post’ columnist Julian Muscat mocking a smug claim that the rain had no effect on the royal meeting because “the right horses still won”. Such glib generalisations make the blood of punters and racegoers boil. Like the one that insists punters have had a good day just because most of the favourites have won. Serious backers make their decisions as individuals, armed with individual opinions, based on individual knowledge. Those who pin blind faith on the betting market or tipsters are not long for the financial hell-hole of cost-cutter. But Soft ground that flies in the face of meteorological logic is a handicap we can all do without. Punters can put up with give in the spring or autumn when it is routinely accepted as an occupational hazard. But as we enter July and dust down the panamas and sunglasses for Newmarket’s July meeting and Glorious Goodwood? In the normal scheme of things, Flat form would have settled down by now and be providing punters with their most consistent, reliable period of the racing year. Instead they are riled by the overwhelming uncertainty Soft ground brings and the lack of assured evidence it fails to bring. Before races, we are left to guess whether our fancies will act on the surface. After races, we are left to guess whether or not the form can be trusted. Saturday’s Coral-Eclipse represented a perfect case in point. The race is a gateway-to-the-summer staple that has developed into one of the highlights of the calendar, pitching the three-year-old generation against their elders. However, a renewal that drew a perfectly acceptable field was marred by the need not necessarily to find the best horse but rather the one who would handle conditions best. TIME TEST’S dislike of dig has long been established, so his reverse was expected, extending his search for a deserved Group One pot. The eclipse of odds-on favourite THE GURKHA was less easy to fathom, but could surely be attributed to his failure to truly quicken on the ground, especially when we recall how devastatingly he did quicken on a much sounder surface in the French 2,000 Guineas at Deauvllle. In prime spot to pick up the pieces was MY DREAM BOAT, only for his proven mud-living credentials, advertised so glaringly at Royal Ascot, where he ran down proven Group One filly FOUND, to be sunk without trace. Which all left us with a surprise winner in HAWKBILL, who also splashed through the underfoot juice at Ascot but who, as jockey William Buick commented, has such a strictly US-based pedigree that you “wouldn’t even walk him on Soft ground”. Before confusion sets in and I get too hung up about this interminable rain, I must make it clear that I have no desire to knock Hawkbill, who deserves enormous credit for the spectacular improvement he has made under trainer Charlie Appleby’s care. It’s very rare for non-Group One winners to take the Eclipse, even rarer for a three-year-old to achieve it without treading the Classic route. There were no signs as a juvenile that the son of Kitten’s Joy had any lofty Pattern pretensions, signing off as he did on an official rating of 89. He was only workmanlike on his seasonal re-appearance in a win at the Guineas meeting that Buick freely admitted took connections by surprise. And he ground out victory in Ascot’s Tercentenary Stakes in similar manner, although he did fend off a very highly-regarded runner-up in PRIZE MONEY. Clearly the colt is maturing fast, with Appleby making the salient point that he had been awash with sweat before previous outings this term, yet was calm and much more professional at Sandown. Also maturing fast is the Godolphin operation, for whom Hawkbill’s triumph maintained a welcome renaissance. Sheikh Mohammed’s organisation pours so much time, effort and investment into our sport and its economy that few will begrudge signs of a return of a like-for-like reward in terms of prestigious prizes. It’s a renaissance that has tellingly coincided with the appointment of John Ferguson as chief executive and racing manager. Ferguson knows his onions. And he knows a good horse when he sees one. For he bought Hawkbill himself at the Keeneland yearling sales nearly two years ago for a cool 350,000 dollars. Lot number 956. On the subject of key individuals, a word too for winning rider Buick, who has now started a 30-day ‘holiday’ that he fully deserves in more ways than one! Yes, he was wrong to question the propriety of the French stewards, who duly slapped him with a hefty suspension, but the ride he gave Hawkbill, particularly when deftly switching his whip in the final furlong, merited a ticket to the beach somewhere. To a place, maybe, where it’s not raining! As if the exploits of the Wales football team are not enough, the country’s best jockey has been making the headlines too. It’s often forgotten that David Probert was champion apprentice when first bursting on to the scene in 2008 -- a title he shared with none other than William Buick. His career has progressed well since, and he gave a timely reminder of his under-rated talents when booting home a four-timer at Brighton at odds of 8,031/1. 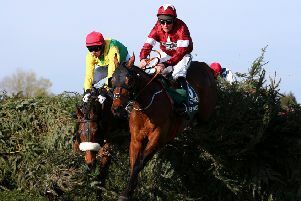 Just like Buick, Probert has all the attributes to be crowned champion proper one day, and his welcome moment in the limelight is in keeping with a trend that surfaced at Royal Ascot, thanks to many other unsung, but gifted, pilots, such as Adam Kirby, Dougie Costello, Rab Havlin, Seamie Heffernan and Colm O’Donoghue.